Nitin Sawhney started the tutoring division of Marks Education in 2006. In addition to his tutoring responsibilities, Nitin directs instructor hiring and training, curriculum development, and business management for the tutoring division of Marks Education. 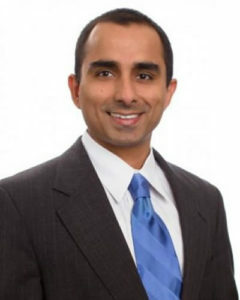 Nitin has been an educator since 1998 and, in this time, he has taught and tutored high-school Math and Economics, college English, and most U.S. standardized tests, from the SSAT and ISEE to the SAT, GRE, GMAT, and LSAT. He has worked with thousands of students across the United States and nine foreign countries. Nitin takes the SAT and ACT at least once a year, the SAT Subject tests, GRE, and GMAT frequently, and regularly scores in the 99th percentile or gets perfect scores. Nitin has been the key developer of Marks Education’s test preparation approach, which regularly helps students improve 1 to 2 standard deviations. He has worked with a wide range of students – from students with learning disabilities to those who are starting in the 700s on the SAT or GMAT and aiming for a perfect score, from students with debilitating test anxiety to those who suffer from a surfeit of confidence. He especially enjoys working with students who have greater than usual challenges and he has been very successful with this population. Nitin reads zealously about the effects of aerobic exercise, meditation, sleep, and diet upon performance. He enjoys running, swimming, and meditating, and has helped many students to use meditation and exercise to manage stress and succeed on tests. Nitin also directs our pro bono test preparation and tutoring program for scholars of Collegiate Directions, Inc. (CDI) and the work with our partner organizations. Nitin has a B.A. in English and Economics from Wesleyan University in Connecticut. He also holds an MFA in Creative Writing from the University of Maryland. Want to work with Nitin? Nitin is a gifted educator, a master of test preparation, and a kind, encouraging instructor. He was able to analyze the manner in which our daughter learns and provide guidance about how to become a better test taker as well as student in the high school classroom. Nitin was always available for questions by phone or email and consistently had a plan, which made our daughter feel confident before the ACT. Although she is glad that her test-preparation days are over, our daughter misses tutoring with Nitin at Marks Education. I would like to give the highest recommendation for Nitin for SAT tutoring. Nitin is a phenomenally knowledgeable person who seems to know a lot about everything, Math, philosophy, world history and creative writing. I am amazed by his intellect and the wonderful way he imparts his knowledge to his students. Nitin is calm, when test time is near, giving encouragement and confidence to his students. He also seems to know what each individual student needs. He recommends practice SATs for some students, while holding back on this idea for others who may not need it. Nitin is amazing, and we are so lucky to have had him to prepare our son for the SAT and Subject Tests. We will use him again for our daughter who is a rising Junior, and, believe it or not, our daughter is looking forward to working with Nitin. Getting our children to go to Nitin is not a battle, it has been a pleasure. Working with Nitin, even with limited time available before our daughter was scheduled to re-take the SAT, significantly raised her scores. He transformed the potentially unpleasant process of preparing for SATs to an energetic experience with an aura of positive anticipation through his ability to spot what precisely what work she needed to do, his kindness and his confidence in her. She loves him and we are deeply grateful for his help. Nitin is quiet, but he really knows his stuff. He gives you great strategies for the tests. Most importantly, he makes you feel that he has the utmost confidence in you, so you go into the test knowing you can and will do well. As the first session finished I could tell that Nitin, just from watching the way I worked for one hour, knew exactly how he would help me improve my scores. We made a plan for what we would review and what I would work on during the week so that by the day of the test I was completely confident that I would do well. After each test we discussed how it had gone, and when my scores arrived three weeks later, I was always amazed that Nitin had guessed them to a point. From vocabulary to algebra to what I should eat for breakfast before a test, working with Nitin was an invaluable experience for me. I had the pleasure of working with Nitin Sawhney in preparation for my SATs, and the experience was invaluable. Nitin worked with me to meet my score goals by providing excellent, focused practice on the areas of study where I needed the most work. He taught me strategies that I had never used before and gave me the confidence I needed to succeed on the test. He was always personable, encouraging, and acted like a friend as well as a teacher. With his help on the SATs, I was admitted to my first choice college Early Decision, which also happens to be Nitin’s alma mater, and I still use the strategies he taught me to succeed on other standardized tests. Throughout my tutoring with Nitin, I have come to know him as an extraordinarily knowledgeable person about ANY topic in discussion. His approach had always been one that enhanced my areas of weaknesses with strategies that sharpened my stronger areas. I felt every exercise was specifically tailored for me and this was justified with the phenomenal improvement in my test scores by almost 300 points. His manner of imparting his knowledge made every matter sink in to my memory and thanks to this, I have successfully improved the scope of my future education. Nitin never hesitated to go beyond his call of duty when it came to any sort of extra assistance that I required, and his great experience in testing strategies is sure to improve results of all my future tests. I highly recommend working with him to all my family and to everyone. Having the opportunity to work with Nitin was a huge opportunity for my son. Even though his tutoring sessions were via conference call from his boarding school, he and Nitin had a wonderful relationship. We are all very fond of Nitin and hold him in the highest regard. Last, but not least, my son’s SAT scores improved dramatically, which put him within the reaches of the colleges and universities he wanted to attend. He was admitted to 4 out of 5 of the schools where he applied. I hope that your son or daughter will have the same opportunity! Nitin is one of the best teachers ever. I was able to go from a 1620 PSAT score to 2250 SAT score under his guidance and assistance. I was also able to get a 760 on my Math II and a 650 on my Lit subject tests. Words aren’t enough to describe how happy I am with Nitin and Marks Education. All I can say is that you can’t go wrong with them. They will help you succeed because it is evident that they genuinely care. I worked with both Nitin Sawhney and Dan Bloss as I prepared to re-take the GMAT and cannot speak highly enough about the experience. Both possess an impressive command of the material and were able to show me more effective ways of approaching certain problem types. In addition, these guys know a lot about test taking strategy and the preparation process. That I was able to raise my GMAT score significantly over the first time was largely a result of their efforts. I would strongly recommend working with either Nitin or Dan.